...This excellent guidebook builds on and updates previous editions to reflect that rapidly changing picture. It will be invaluable to canal users, and a delight to those who prefer to enjoy them from afar. 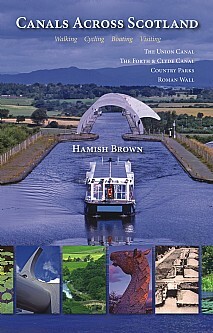 This entertaining and informative book will be of practical benefit to all who discover the historic Union Canal and the Forth & Clyde Canal, whether walking, cycling, boating or visiting the Falkirk Wheel or the Kelpies. The canals are for fun, whether on the water, on the towpath, walking or cycling or just visiting. The canals can be enjoyed at any season. In winter, with the trees leafless, the views are more extensive and there is less traffic on towpath or waterway. In high summer the green world of trees is almost overwhelming, the banks crowded with sweet reed grass, meadow sweet, willowherbs, vetches and many spreads of yellow waterlily, a real Wind in the Willows world. In autumn there are brambles to be eaten, in spring the returning wildlife spree, with swans nesting and swallows swooping. The canals are a scenic treat and will repay many visits or a dedicated holiday challenge. Canals Across Scotland provides detailed towpath information, suggests what to see and do along the way and in the towns passed. The book is full of fascinating historical background, knowledgeable descriptions, practical information, good stories and is beautifully illustrated. Side trips to the Antonine Wall, which stretches from the Firth of Forth to the Firth of Clyde, country parks or to towns like Linlithgow, Falkirk, Kilsyth and Kirkintilloch, often by circular walks, are also described. The canals are for leisurely, timeless exploring and this updated guide will be an essential companion. This will be the ideal book for anyone visiting the canals and surrounding areas whether on foot, bicycle or on the water and will also appeal to anyone wishing to learn more about these historic canals.